Be the first to share your favorite memory, photo or story of Lois Ann. This memorial page is dedicated for family, friends and future generations to celebrate the life of their loved one. TURBEVILLE – Lois Ann DuBose Green, 80, widow of Aubery Dean Green, died Friday, March 22, 2019, at her home. Born January 23, 1939, in Sumter, she was a daughter of the late Tiney Ellen DuBose. She was a member of New Zion United Methodist Church. She is survived by a son, Cecil Lewis; a brother, Bill Brown; a sister, Beth Copenhaver, all of Turbeville; five grandchildren; Sheldon Floyd of Florence, Travis Thomas (Tonyelle) of Barrineau, Justin Lewis of Manning, Chelsey Lewis of Turbeville and Cory Lewis of Greenville; and five great grandchildren. 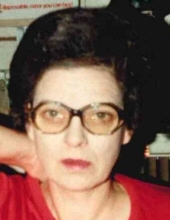 In addition to her husband and mother, she was preceded in death by a daughter, Cynthia Ann Thomas. A funeral service will be held at 11 a.m. on Monday, March 25, 2019, in the chapel of Stephens Funeral Home with the Rev. Devon Coker officiating. Burial will follow at New Zion United Methodist Church Cemetery. Pallbearers will be Kasey Helms, Alex Welch, Zachary Atkinson, Paul Atkinson, Willard Jackson, Jr. and Steve Gibbons. Visitation will be held from 3 to 5 p.m. on Sunday, March 24, 2019, at Stephens Funeral Home and other times at the residence, 6250 Puddin Swamp Road, Turbeville. To send flowers or a remembrance gift to the family of Lois Ann DuBose Green, please visit our Tribute Store. And other times at the residence, 6250 Puddin Swamp Road, Turbeville. "Email Address" would like to share the life celebration of Lois Ann DuBose Green. Click on the "link" to go to share a favorite memory or leave a condolence message for the family.